You are currently browsing the The Pet Product Guru blog archives for the day Thursday, May 24th, 2018. 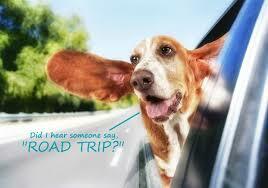 Summertime is almost here and it’s time to start thinking about that road trip with your pet. Gopetfriendly.com had put together a very useful checklist for you. Thank you to gopetfriendly.com for such a thorough checklist! Make a visit to your vet to for a check-up, confirm all vaccinations are up to date, and discuss any possible concerns about flea, tick or heart worm risks where you will be heading. It’s also a good idea to ask about remedies for car sickness, diarrhea, and allergic reactions – just in case! Finally, consider having your pet micro-chipped. It would be a nightmare, but pets can get separated from their people while traveling. A traveling pet ID tag and a microchip will give you the best chances of finding your furry travel companion if he should get lost. After your visit, pack your pet’s vaccination certificate and scan the rest of his medical records to a USB drive to take along on your trip. Once your pet has gotten a “thumbs up” from the vet, you’ll need to decide how you’ll be traveling. Most people take their own car, and if that’s your plan, make sure it’s tuned up and ready for the drive. Another option is to contact a pet friendly RV rental company and get a motorhome for your trip. Regardless of how you’ll be getting from here to there, the most important part of any trip is making sure y’all come home safely. Using either a car safety harness or secured carrier for your pets will protect them in case of an accident and prevent them from bolting out of the car in unfamiliar territory. Our pet friendly Road Trip Planner will help you visualize your route and locate pet friendly hotels, campgrounds, restaurants, and activities – like dog parks and pet friendly beaches – along the way. You can also find veterinarians, pet supply stores, and pet sitters or daycare facilities, if the need arises. Whether you’re pitching your tent in pet friendly campgrounds on your way across the States, or staying in pet friendly hotels, consider making reservations in advance. Campgrounds may be busy on weekends and holidays, and some hotels only offer a limited number of pet friendly rooms. Even if you prefer to seize the moment and follow your nose, making a few reservations along the way will provide some peace of mind that you’ll have a place to stay. A disposable litter box and litter for your cat. Your pet’s bed and a couple of toys – to make him more comfortable when you spend the night in unfamiliar locations. Whether you’re planning to visit the most dog friendly national parks, cross the border to Canada, or embark on the Ultimate Pet Friendly American Road Trip, remember that traveling with your pets is the perfect time to slow down and sniff the roses! Hustling from place to place can make your vacation feel more like work, so underestimate what you can accomplish. We’ve found that driving no more than 300 miles per day works well for us – we have time to stick to the dogs’ exercise and feeding routines and plenty of time to enjoy the sights along the way. If you love oldies and love travel, Edgewater Gold Radio is your worldwide internet oldies station serving the world with the greatest variety of oldies from the 50s 60s 70s 80s and great standards. Download the free Edgewater Gold Radio app or listen from our website edgewategoldradio.com.